Laminitis or Founder, is a devastating disease that can quickly destroy a horse's career or end its life through euthanasia. Reduced blood supply to the foot is a crucial factor in laminitis, resulting in severe pain and cell death. 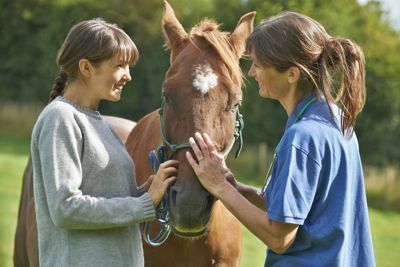 Laminitis is usually preceded by stress of some type. Stress depletes the body of chemicals called "neurotransmitters." Certain neurotransmitters are needed for blood vessels to dilate and remain fully open. Without sufficient amounts of these neurotransmitters, blood vessels tend to stay constricted, which reduces blood supply to a horse's feet. Nitric Oxide is a gaseous neurotransmitter that is involved in relaxing the walls of blood vessels. Nitric Oxide maintains blood vessels in an open state and enhances blood supply. Nitric Oxide stimulates the release of cyclic GMP, which results in vasodilation. Insufficient functioning of the Nitric Oxide-cyclic GMP pathway has been implicated in the pathogenesis of conditions such as erectile dysfunction, myocardial ischemia, and asthma. Previously, attending such conditions required the use of pharmaceutical agents that either donate Nitric Oxide directly (i.e. nitroglycerin), or inhibit the enzymatic breakdown of cyclic GMP, (i.e. Viagra/sildenafil). However, such pharmaceutical agents are incapable of increasing endogenous synthesis of Nitric Oxide. Thus, pharmaceutical agents utilized to compensate for insufficient Nitric Oxide production are incapable of correcting the underlying deficiency for which they are commonly prescribed. Rather than attempting to inhibit the breakdown of cyclic GMP or donating Nitric Oxide itself, a logical alternative strategy would be to promote increased synthesis of Nitric Oxide with Nitro PRO. The discovery of Nitric Oxide won a Nobel Prize. We are please to be able to offer a product such as Nitro PRO to trigger the release of Nitric Oxide so the horse can heal its self of Laminitis.